AstroNews is an astronomy and spaceflight-related website providing the latest news and information from around the world. ALMA’s Long Baseline Campaign produced spectacular images of the distant, gravitationally lensed galaxy called HATLAS J090311.6+003906, otherwise known as SDP.81. New analyses of these images reveal details never before seen in a galaxy so remote, including phenomenally massive yet concentrated clumps of star-forming material. The ALMA observations of SDP.81, made at the end of 2014, were enabled by a cosmic effect known as gravitational lensing. A large galaxy nestled between SDP.81 and ALMA is acting as a lens, magnifying the more distant galaxy’s light and warping it into a near-perfect example of a phenomenon known as an Einstein Ring. In the months following these observations, at least seven groups of scientists have independently analyzed the ALMA data on SDP.81. This flurry of research papers has divulged unprecedented information about the galaxy, including details about its structure, contents, motion, and other physical characteristics. 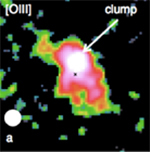 As part of an observing program carried out with the Subaru Telescope and the Hubble Space Telescope, a group of researchers from the “Service d’Astrophysique-Laboratoire AIM” of CEA-IRFU led by Anita Zanella discovered the birth cry of a massive star-forming clump in the disk of a very distant galaxy. This giant clump is less than 10 million years old, and it is the very first time that such a young star-forming region is observed in the distant Universe. This discovery sheds new light on how stars were born within distant galaxies. The physical properties of this object reveal that newly-born clumps in such galaxies survive from stellar winds and supernovae feedback, and can thus live for a few hundred million years unlike the predictions from several theoretical models. Their long lifetime could enable their migration toward the inner regions of the galaxy, hence contributing to the total mass of the galactic bulge and the growth of the central black hole. These results are published in the “Nature” journal from May 2015. An international team of researchers led by Pieter van Dokkum at Yale University have used the W. M. Keck Observatory to confirm the existence of the most diffuse class of galaxies known in the universe. These “fluffiest galaxies” are nearly as wide as our own Milky Way galaxy – about 60,000 light years – yet harbor only one percent as many stars. The findings were recently published in the Astrophysical Journal Letters. As murder mysteries go, it’s a big one: how do galaxies die and what kills them? A new study, published today in the journal Nature, has found that the primary cause of galactic death is strangulation, which occurs after galaxies are cut off from the raw materials needed to make new stars. Researchers from the University of Cambridge and the Royal Observatory Edinburgh have found that levels of metals contained in dead galaxies provide key ‘fingerprints’, making it possible to determine the cause of death. There are two types of galaxies in the Universe: roughly half are ‘alive’ galaxies which produce stars, and the other half are ‘dead’ ones which don’t. Alive galaxies such as our own Milky Way are rich in the cold gas – mostly hydrogen – needed to produce new stars, while dead galaxies have very low supplies. What had been unknown is what’s responsible for killing the dead ones. For the past several years, scientists at the U.S. Department of Energy’s Lawrence Berkeley National Lab (Berkeley Lab) have been planning the construction of and developing technologies for a very special instrument that will create the most extensive three-dimensional map of the universe to date. Called DESI for Dark Energy Spectroscopic Instrument, this project will trace the growth history of the universe rather like the way you might track your child’s height with pencil marks climbing up a doorframe. But DESI will start from the present and work back into the past. DESI will make a full 3D map pinpointing galaxies’ locations across the universe. The map, unprecedented in its size and scope, will allow scientists to test theories of dark energy, the mysterious force that appears to cause the accelerating expansion and stretching of the universe first discovered in observations of supernovae by groups led by Saul Perlmutter at Berkeley Lab and by Brian Schmidt, now at Australian National University, and Adam Riess, now at Johns Hopkins University. For the first time, scientists and the public are beginning to see the large-scale structure of the universe, thanks to the Sloan Digital Sky Survey. UA scientists provide scientific expertise and crucial technology to the largest project ever undertaken to map the cosmos. On Jan. 6, the Sloan Digital Sky Survey issued its latest public data release, the final release of the third epoch of the survey. Weighing in at more than 100 Terabytes, “Data Release 12” (DR12) contains measurements of the properties of nearly half a billion stars and galaxies, making it one of the largest and richest databases in the history of astronomy. “The most astonishing feature of the SDSS is the breadth of ground-breaking research it enables,” said Daniel Eisenstein of the Harvard-Smithsonian Center for Astrophysics, the director of SDSS-III. Eisenstein started the survey during his tenure as a professor at the UA’s Steward Observatory, one of the survey’s partner institutions. Galaxy groups are the most evident structures in the nearby universe. They are important laboratories for studying how galaxies form and evolve beyond our own Local Group of galaxies, which includes the Milky Way and the Great Spiral in Andromeda. Exploring the nature of these extragalactic “herds” may help to unlock the secrets to the overall structure of the universe. Unlike animal herds, which are generally the same species traveling together, most galaxies move through space in associations comprised of myriad types, shapes, and sizes. 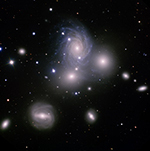 Galaxy groups differ in their richness, size, and internal structure as well as the ages of their members. Some group galaxies are composed mainly of ancient stars, while others radiate with the power and splendor of youth. These facts raise important questions for astronomers: Do all the galaxies in a group share a common origin? Are some just chance alignments? Or do galaxy groups pick up “strays” along the way and amalgamate them into the group? We’ve Revealed A Galaxy Far, Far Away….